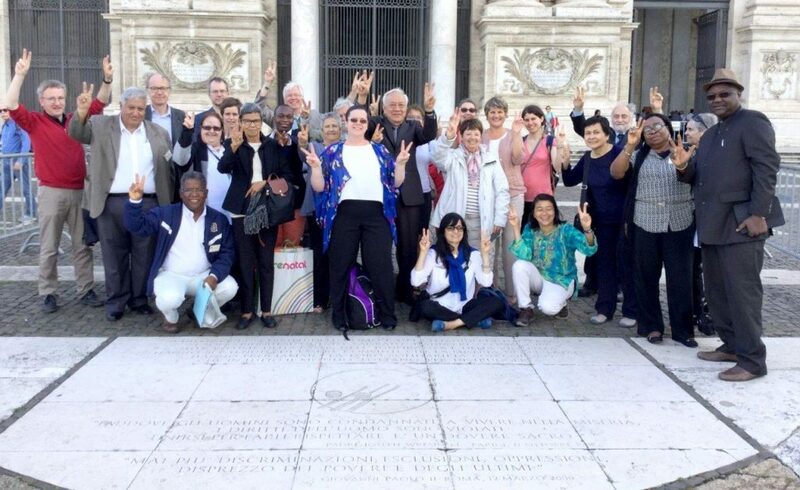 The International Committee for October 17 successfully convened its Seventh Biennial meeting in Rome from May 15 to 17, 2018. 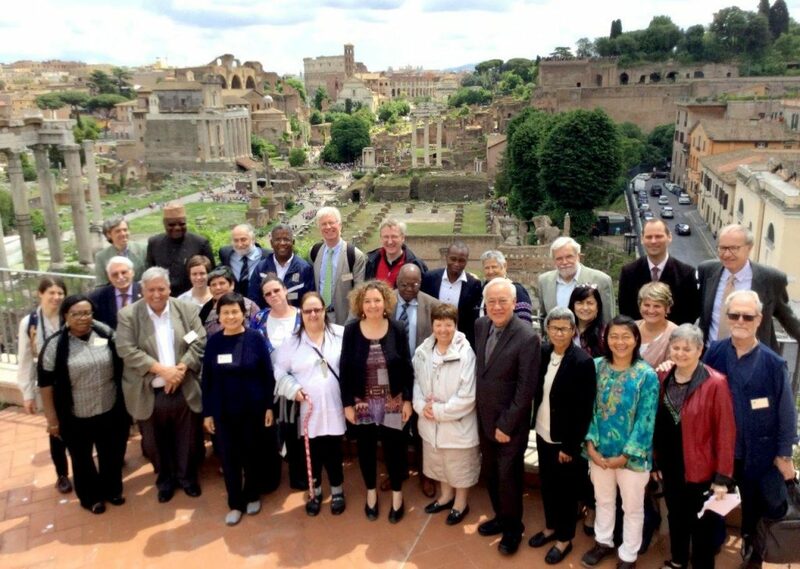 Belinda Nugent from Dublin represented Ireland and the Irish Committee at this meeting. During these two days, the Committee reviewed the implementation of its work programme since its last meeting, including its participation in the 2017 ‘Stop Poverty’ global campaign, and has prepared its work programme for the next biennium, including preparations for the upcoming October 17 commemorations in 2018 and 2019. It met representatives of the Holy See to discuss possible cooperation in the fight against poverty. 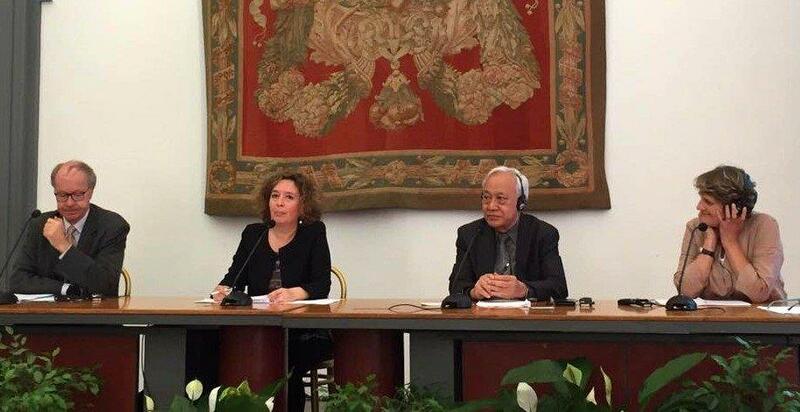 During its public closing session, in collaboration with the City of Rome, at the Campidoglio in Rome, Mr. Donald Lee, President of the International Committee and Ms. Isabelle Pypaert-Perrin, General Director of the International Movement ATD Fourth World presented the outcome of the Seventh Biennial meeting at the event which was attended by representatives of several Embassies and the Rome Municipality, and other invited guests. During this special session, Mr. Donald Lee announced the release of the Committee’s 2018 Rome Declaration, which includes a call for a mechanism at the United Nations to ensure the effective participation and voice of people living in poverty and extreme poverty. Download a pdf version of the 2018 Final Declaration here. 1. Note that the United Nations reports extreme poverty has fallen globally but progress has been uneven, and 1.6 billion people still live in multidimensional poverty. We commend the goal of the United Nations to end “poverty in all its forms and dimensions” and are concerned about its target to “reduce at least by half the proportion of men, women and children of all ages living in poverty in all its dimensions” by 2030. We urge the United Nations to ensure no one is left behind and to fully mobilize its efforts to end poverty in all its dimensions for everyone everywhere by 2030, including through effective implementation of its Social Protection Floor initiative. 2. Emphasize that to ensure that we leave no one behind requires an understanding of multidimensional poverty. We support the important contribution to better understanding multidimensional poverty through the participatory research project jointly carried by Oxford University, ATD Fourth World and other partners, that recognizes the knowledge of the poorest populations themselves, and brings together people living in poverty, grassroots workers and academics from eight countries. We urge all Governments and the United Nations to incorporate the final findings of this ongoing project into their efforts to end poverty in all its dimensions, and to take into account the Guiding Principles on Extreme Poverty and Human Rights adopted by the Human Rights Council in its resolution 21/11 of September 27th, 2012. 3. Note that the Secretary-General of the United Nations has emphasized “that the most systemic threat to humankind remains climate change” and that the Special Rapporteur on human rights and the environment has stressed that a “safe, clean, healthy and sustainable environment is integral to the full enjoyment of a wide range of human rights, including the rights to life, health, food, water and sanitation.” It has been demonstrated that people who are most excluded will be hardest hit by the negative impacts of climate change and environmental pollution/degradation, including from exploitative and environmentally destructive mining operations. We call upon the international community to urgently address climate change and the degradation of the environment which threaten the rights to life, health, food, water and sanitation of those most excluded and furthest behind, while recognizing the important role they play in fighting climate change and protecting the environment. 4. Deplore the unacceptable situation of nearly 22.5 million refugees worldwide, over half of whom are under the age of 18, who have been forced from their homes by conflict, persecution and poverty. For example, the conflict in Syria, alone, has produced 5.5 million refugees. More recently, the refugee crisis in Rakhine State on the Myanmar-Bangladesh border is of great concern and urgent action is needed. The United Nations must prevent and eliminate all forms of violence and discrimination against refugees and reach agreement on its proposed Global Compact on Refugees as soon as possible. We urge all Governments and the United Nations to protect the human rights of all refugees and ensure they are not left behind in the fight against poverty. On the 17th of October 1987, defenders of human and civil rights from every continent gathered on this plaza. They paid homage to the victims of hunger, ignorance and violence. They affirmed their conviction that human misery is not inevitable. They pledged their solidarity with all people who, throughout the world, strive to eradicate extreme poverty. Today, in addition to the replica of the Commemorative Stone at the United Nations Headquarters in New York, 50 other replicas of the Commemorative Stone and/or its message have been created around the world. 6. Recall also that since then, on the 17th of October each year, we have come together to demonstrate the strong bonds of solidarity between people living in poverty and people from all walks of life, and to renew our commitment to work together to overcome extreme poverty and abuse of human rights through our individual and shared commitments and action. We commit to vigorously promote the International Day for the Eradication of Poverty, which publicly unites all those who are striving together to end poverty and those who want to join them, whether at global, national or local levels. 7. Recognize that eradicating poverty and promoting prosperity for all require collective and transformative commitments which put the furthest behind first. 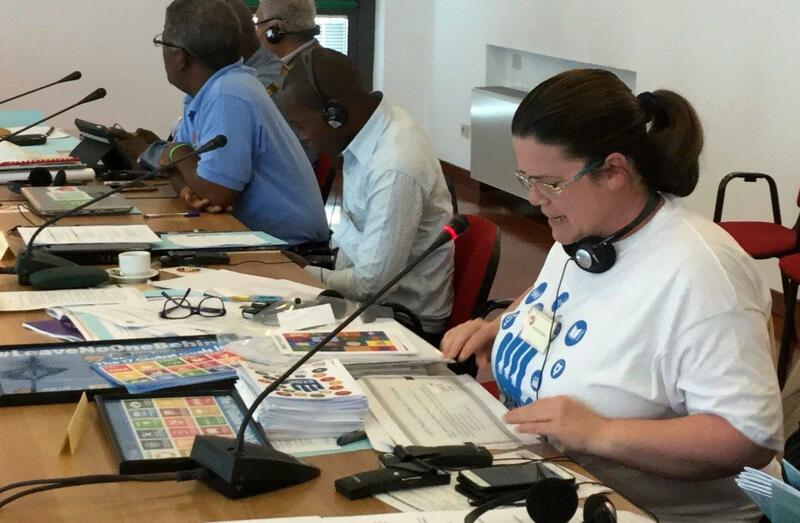 An important commitment is to honour the human dignity of people living in poverty and to fight to end the discrimination, humiliation and social exclusion they suffer. Another is to create safe spaces which encourage people living in extreme poverty to break the silence of poverty and to act in solidarity with those who aspire to be their partners in the fight against poverty. We commit to vigorously support and promote the observance of the International Day in ways that respect the original spirit and meaning of the World Day for Overcoming Extreme Poverty, and to promote and safeguard spaces where people from very different backgrounds can be together in a unique way, to struggle against extreme poverty and violations of human rights, and to strive towards peace for all. 8. Recall that the year 2017 marked the 30th anniversary of the Call to Action by Joseph Wresinki which inspired the observance of October 17 as the World Day for Overcoming Extreme Poverty, and the 25th anniversary of the recognition by the United Nations of the day as the International Day for the Eradication of Poverty. To mark these auspicious anniversaries, the International Committee for October 17 in partnership with the International Movement ATD Fourth World jointly launched the global campaign “Stop Poverty: All Together in Dignity” which invited people everywhere to make a personal pledge to join the Call to Action in 2017. We call upon the United Nations to update its 2006 review of the contribution of the observance of the International Day to the mobilization of all stakeholders in the fight against poverty, and to urgently consider establishing a mechanism at the United Nations to ensure the effective participation and voice of people living in poverty and extreme poverty. 9. Recall also that the global campaign invited individuals, communities, organizations and countries to prepare for and celebrate October 17 in 2017 in many rich and diverse ways, including discovering or sharing stories that show how poverty can be overcome when people join together in efforts to uphold the rights of all; organizing or participating in cultural events to celebrate the courage and the daily fight of the poorest; and engaging in meaningful dialogue about how to build a society that leaves no one behind. We commit to building on the powerful momentum created by the global campaign in 2017 to create greater awareness of the meaning and spirit of October 17 and to promote its observance more widely around the world. 10. Note that the year 2018 marks the 70th anniversary of the proclamation of the Universal Declaration of Human Rights by the United Nations General Assembly, in its resolution 217A, on 10 December 1948. The United Nations has launched a campaign calling on everyone, individuals as well as governments, companies, the civil society, the UN family and others to promote and defend human rights. We look forward to collaborating with the United Nations and other partners in this global campaign, together with the full participation of activists and people living in poverty. In this regard, we urge all Governments to use this auspicious anniversary to renew their commitment to respect, protect and fulfil their human rights obligations, including the International Covenant on Economic Social and Cultural Rights, the International Covenant on Civil and Political Rights and other relevant international human rights instruments. 11. Reiterate that peace is the universal goal of all people, especially for people living in poverty who are forced to suffer the pain of exclusion, discrimination, injustice and violence, and that only a world free from poverty will provide the sustainable foundation for building peaceful and inclusive societies. We call upon all world leaders to ensure they translate their commitments into effective implementation to end poverty in all its forms and to build peaceful societies.